A SPECIAL DISCOUNT FOR YOUR COMPANY! Companies are invited to participate in The Durham Museum’s corporate membership drive to make discounted memberships available to employees. By promoting Durham Museum memberships to employees, the museum will provide a $5 savings on Individual and Family memberships. Click here to view the benefits of a membership! 1. Designate a company liaison at your organization and contact The Durham Museum’s membership department at membership@durhammuseum.org. 2. The museum will provide your liaison with membership information and promotional materials. 3. Promote your company’s drive via e-mail, payroll inserts, memos, newsletters or posters. 4. The company liaison will collect membership applications and mail them directly to The Durham Museum’s membership department OR employees can purchase the discounted membership online using their company’s unique discount code. The Add-On Features can be added to any individual or family level membership. Both Add-On Features are included in all Patron level memberships. Please note: Discount will be applied at check out. 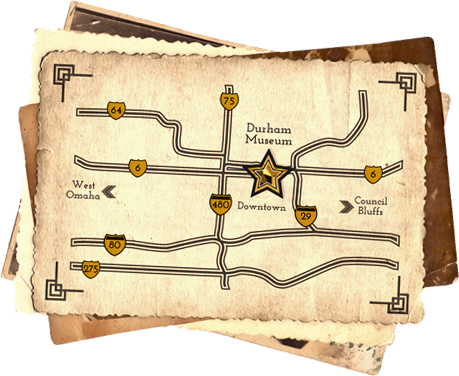 membership@DurhamMuseum.org or call (402) 444-5071, ext. 521. Thank You To our 2017 Corporate membership drive partners!